LAS VEGAS – Recognized as one of the country’s top food, wine and spirits festivals, Vegas Uncork’d by Bon Appétit returns April 27-30 with one-of-a-kind experiences and a world-class lineup of renowned celebrity chefs, master sommeliers and cutting-edge mixologists from Caesars Palace, The Cromwell, The Cosmopolitan of Las Vegas, MGM Resorts International, The Palazzo and The Venetian Las Vegas. 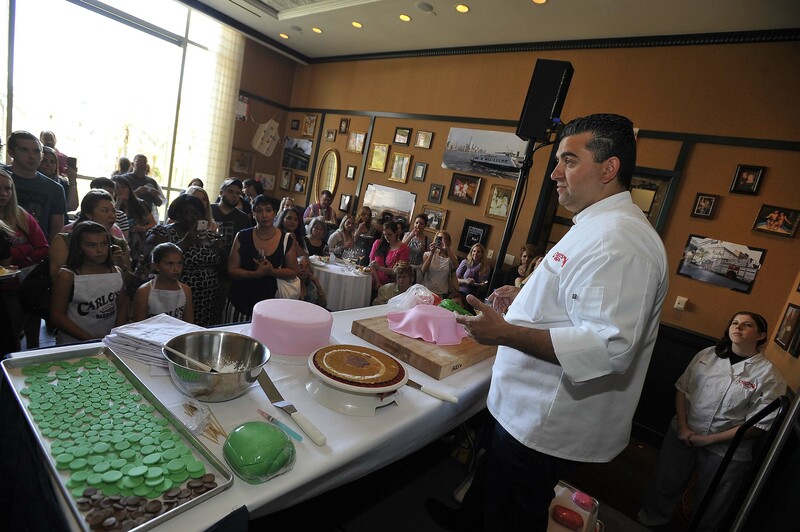 Presented by sponsor Chase Sapphire®, the 11th annual epicurean indulgence will continue its tradition of bringing the world’s most iconic chefs together including Alain Ducasse, Bobby Flay, Buddy Valastro, Charlie Palmer, Giada De Laurentiis, Gordon Ramsay, Guy Savoy, José Andrés, Julian Serrano, Shawn McClain, Michael Chow, Nobu Matsuhisa and Wolfgang Puck, among others. Tickets are on sale now for perennial favorites such as the Grand Tasting at Caesars Palace and Little Italy From City To Strip: Rao’s Italian Brunch with The Rao’s Family at Caesars Palace, as well as new events, including Picnic in The Park, MGM Resorts’ new outdoor dining and entertainment district, Lunch like a Spaniard with José Andrés at The Cosmopolitan, Brunch with Bobby Flay at Caesars Palace, Sweet Escape: An Evening of Buddy, Beignets, Bon Bons & Booze at The Palazzo and Three-Kitchen Tasting at SUGARCANE raw bar grill with Chef Timon Balloo at The Venetian. 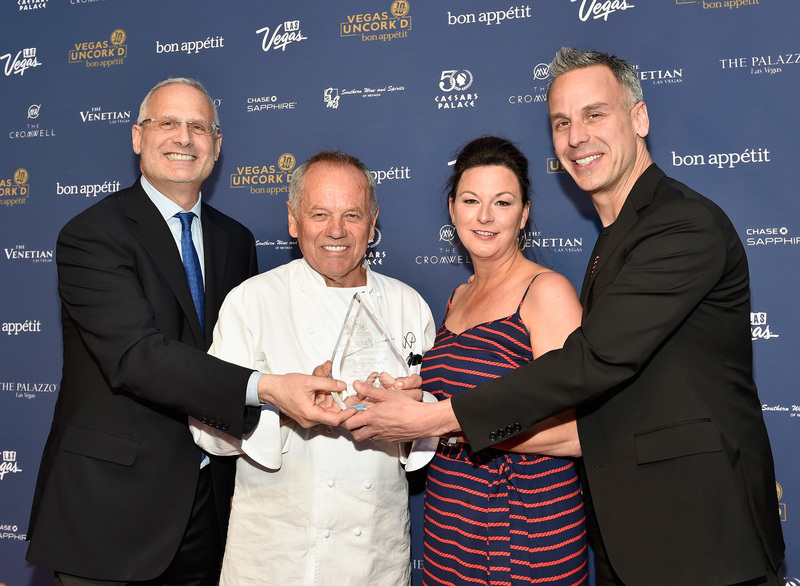 Additionally, Chase Sapphire returns for the fifth consecutive year as the presenting sponsor of Vegas Uncork’d by Bon Appétit. Chase Sapphire Preferred® and Sapphire ReserveSM cardmembers can enjoy unique access to select experiences and interaction with celebrity chefs throughout the four-day festival. Cardmember packages will be available for purchase through April 12, 2017, while supplies last. For more information on Sapphire Preferred® and Sapphire Reserve cardmember packages visit, vegasuncorked.com/ChaseSapphire. 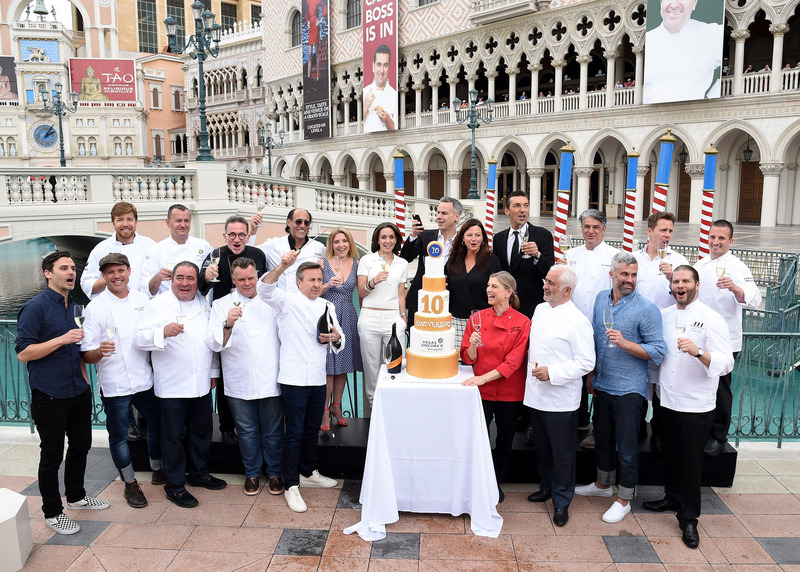 Master Series: Rao’s 10th Anniversary Dinner (Caesars Palace), Thursday, April 27: Rao’s is widely regarded as the hardest reservation to land in the country, if not the world. Guests will have the opportunity to grab a seat at Rao’s in Las Vegas as the Rao’s family celebrates its 10th Anniversary on the Strip and their newest cookbook, “Rao’s Classics,” written by Rao’s owners Frank Pellegrino Sr. and Frank Pellegrino Jr. From time-honored Italian staples to classics that are uniquely Rao’s, like their famous lemon chicken, don’t miss the opportunity to celebrate this milestone with a multi-course meal at an Italian-American dining institution. Quickfire Happy Hour with Chefs Mary Sue Milliken and Susan Feniger (Caesars Palace), Thursday, April 27: Ever wondered what it takes to win a quickfire challenge? Don’t miss this once in a lifetime opportunity to feel like a contestant on a cooking competition show. 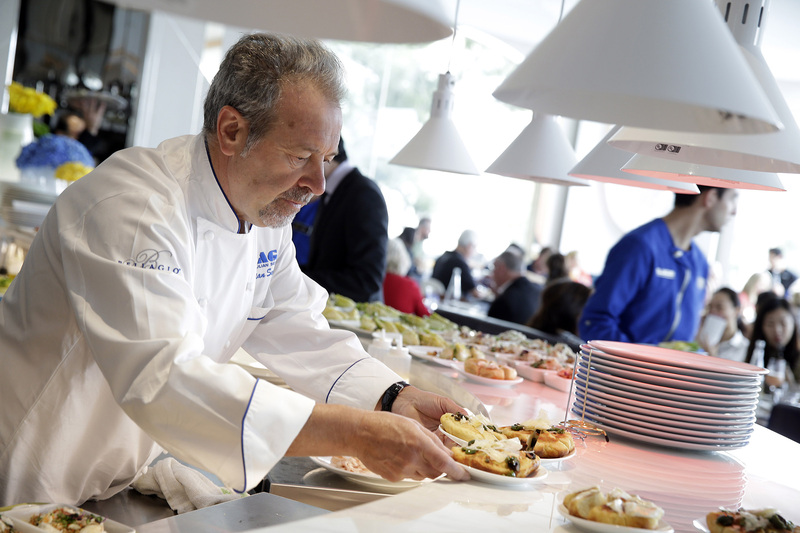 Put your culinary chops to the test and become part of the action! Guests will divide into teams and compete in a series of quickfire challenges all while enjoying free-flowing cocktails, cool craft beers, and signature Border Grill bites. Celebrity chefs Mary Sue Milliken and Susan Feniger will be on hand to coach the teams and provide participants with top-notch advice before they face the panel of judges. The Hog in the Hen House: Yardbird Presents A Pot Belly Brunch (The Venetian), Friday, April 28: From the fried green tomato BLT with house-smoked pork belly to maple-glazed bacon doughnuts, Yardbird’s exclusive Pot Belly Brunch will be a hog heaven for lovers of all things bacon and pork belly. Enjoy a range of Yardbird’s inventive Southern comfort dishes while sipping on a bloody mary with bacon infused vodka. 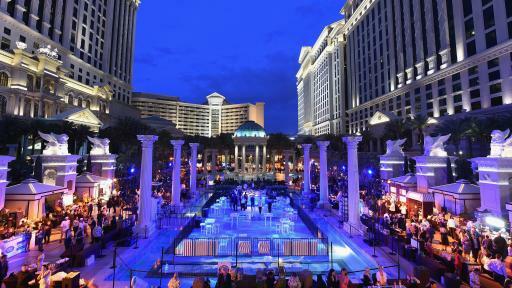 Brunch with Bobby Flay at Mesa Grill (Caesars Palace), Saturday, April 29: This event is so popular it has two seatings! 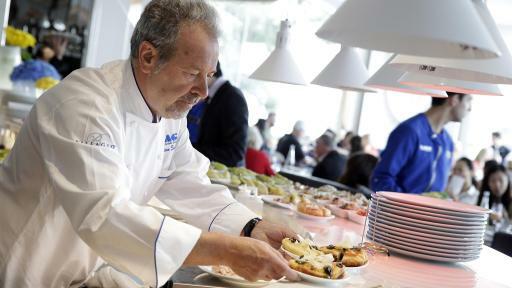 Make your way to Mesa Grill for an outstanding morning with one of America’s most beloved chefs. Guests will indulge in an array of delicious brunch dishes prepared by Chef Bobby Flay, served alongside perfectly paired cocktails in an intimate private dining room setting. Picnic in The Park with Alain Ducasse, Charlie Palmer, Michael Mina, Julian Serrano, Shawn McClain, Roy Ellamar, Akira Back, the Voltaggio Brothers & More (The Park, located between Monte Carlo and New York-New York), Saturday, April 29: Enjoy a Picnic in The Park Vegas style! Featuring live music and some of MGM Resorts’ most notable chefs including Alain Ducasse, Charlie Palmer, Julian Serrano, Michael Mina, Shawn McClain, Roy Ellamar, Akira Back, and the Voltaggio brothers, Picnic in The Park will offer creative twists on classic picnic dishes. We encourage you to embrace your inner-child with coloring books, classic board games and a variety of social games such as foosball, shuffleboard, ping pong and corn hole. And don’t forget to take a selfie with Bliss Dance, a 40-foot-tall sculpture by artist Marco Cochrane and a focal point of The Park experience. 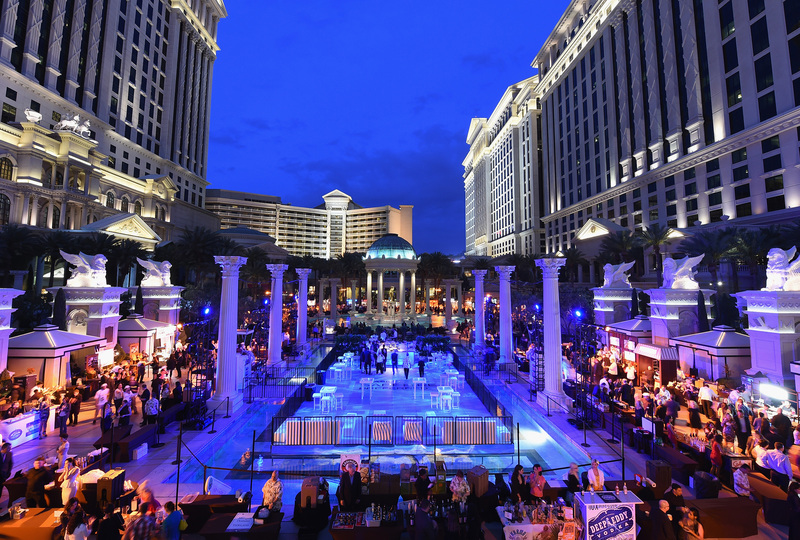 Located on the Las Vegas Strip between Monte Carlo and New York-New York, this new outdoor dining, and entertainment district will provide an ideal backdrop for you to enjoy a fun, interactive afternoon picnicking with celebrated chefs. Sweet Escape: An Evening of Buddy, Beignets, Bon Bons & Booze (The Palazzo), Saturday, April 29: Buddy “Cake Boss” Valastro hosts a decadent evening to surrender to the sweet side of life, featuring the Chefs of The Venetian and The Palazzo, each preparing a unique take on beignets or bon bons. The poolside reception will include an excited live band and delicious specialty cocktails. Special appearance by Chef Lorena Garcia of Chica, opening at The Venetian in 2017. Master Series: Rich Tradition with a New Twist with Old Homestead’s Greg & Marc Sherry (Caesars Palace), Thursday, April 27: A delicious evening awaits guests at this year’s Old Homestead Dinner. Greg and Marc Sherry’s event is back by popular demand, and this year they present a stellar menu of divine dishes and pairings featuring steak, premium wines, and chocolate. Master Series: The World's Best, An Epicurean Affair With Guy Savoy (Caesars Palace), Thursday, April 27: Guy Savoy, a Michelin-starred chef, will present a multi-course epicurean affair with premier pairings, serving signature dishes normally found at his Paris location alongside some of the world’s great wines and champagnes. With his Paris restaurant recently receiving the “Best Restaurant in the World” acclaim from La Liste, this meal will take diners on a truly special adventure across Chef Guy Savoy’s empire of tastes and influences, celebrating his achievements through his signature creations. Don’t miss this rare opportunity for an intimate dining experience with a world-renowned legend. Krug Chef’s Table: Experience exclusive like never before and be one of six at the extremely intimate Chef’s table—your portal into the chef’s den. At the only Krug Chef’s Table in the U.S., guests will sip the luxurious Krug Champagne and dine on a special menu prepared by Chef Guy Savoy right in front of them. For a smaller party, please inquire. Robin Leach & Gary Selesner Invite You to a Culinary Journey Around the World at Bacchanal Buffet (Caesars Palace), Friday, April 28: Join "Lifestyles of the Rich and Famous" host Robin Leach and Caesars Palace President Gary Selesner for a culinary adventure at Bacchanal Buffet—named the #1 buffet in Las Vegas. It’s here the renowned chef team will present an around the world culinary journey that showcases dishes from different countries and cuisines, paired with premier global wines, all while listening to Leach and Selesner recount their worldly travels and the authenticity of each bite. 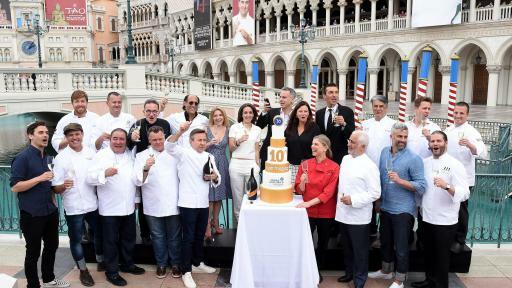 The Grand Tasting (Caesars Palace), Friday, April 28: The Grand Tasting is the signature event of Vegas Uncork’d, where over 2,500 food enthusiasts enjoy a staggering variety of signature dishes prepared by some of the world’s most celebrated chefs. 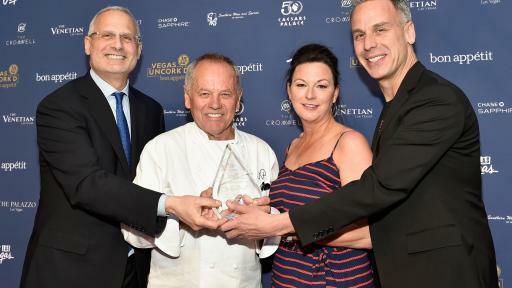 The dramatic five-acre Garden of the Gods Pool Oasis at Caesars Palace Las Vegas Hotel & Casino will feature more than 50 award-winning chefs and over 100 of the best wines and spirits from around the world. Brunch at GIADA: An Italian Inspired Feast (The Cromwell), Saturday, April 29: Join chef Giada De Laurentiis for brunch at her award-winning first and only namesake restaurant. 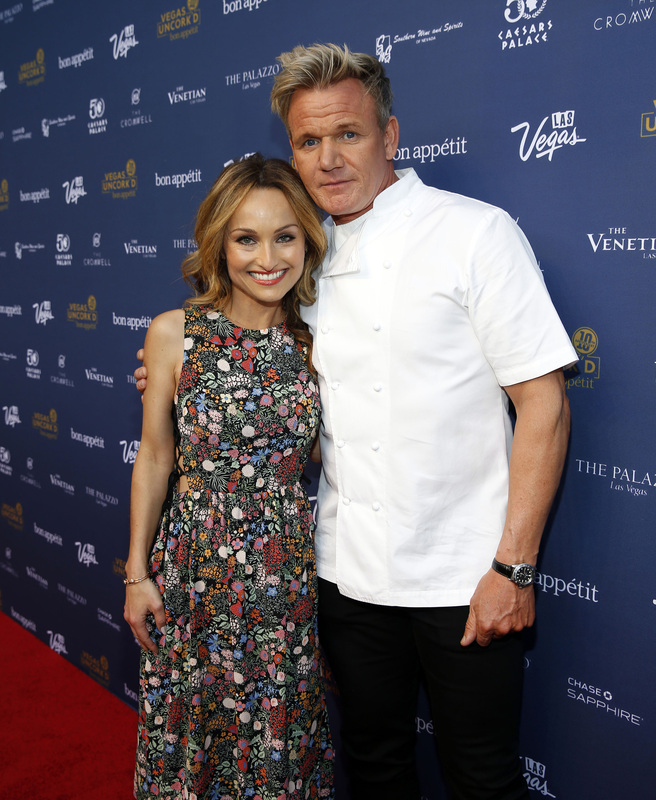 Guests will be delighted by GIADA’s brunch menu, highlighting her California-inspired Italian cuisine, indulge in limitless mimosas, live entertainment, and more with the Emmy Award-winning celebridy chef and New York Times best-selling author. 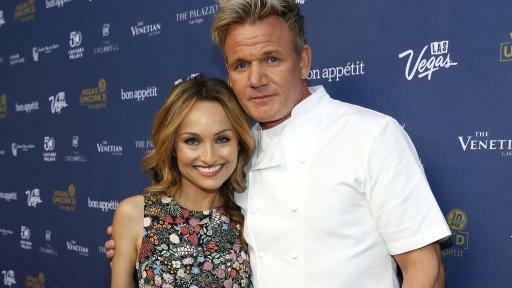 Guests will also receive a signed photo with Giada. Master Series: Nobu Matsuhisa’s Ultimate Teppan Experience (Caesars Palace), Saturday, April 29: The perfect event for fans of the culinary master and connoisseur, Chef Nobu Matsuhisa! During two seatings, he’ll showcase his skills on the traditional Teppanyaki grills inside his Caesars Palace restaurant, giving guests a live view of their food prepared before their eyes by the celebrity chef. As the first Nobu location in the U.S. to feature Teppanyaki grills, guests can enjoy a one-of-a-kind experience with Chef Nobu. Master Series: The Beauty of Sushi with Chef Nobu Matsuhisa (Caesars Palace), Saturday, April 29: Journey inside legendary Japanese chef Nobu Matsuhisa’s expansive Las Vegas destination restaurant for a rare opportunity to hear about the philosophy of sushi making from one of the world’s foremost artisans and restaurateurs. Born in Japan, Chef Matsuhisa has used his travels around the globe to create both authentic and inventive Japanese cuisine. This signature event will give guests the chance to see Nobu’s sushi making in action while also sipping premier sake from some of Japan’s finest producers. Discover his inventive “Nobu Style” that fuses classic sushi-making techniques with unexpected ingredients. 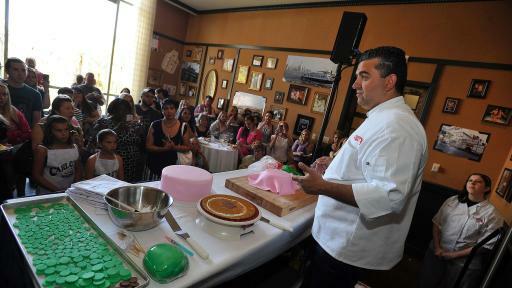 Little Italy From City To Strip: Rao’s Italian Brunch with The Rao’s Family (Caesars Palace), Sunday, April 30: Transport yourself to Southern Italy at this intimate afternoon affair at the exclusive Rao’s Restaurant. Guests will join the Rao’s family for a premium experience, enjoying a seasonally inspired multi-course brunch, featuring authentic family recipes, distinctive cocktails, and non-stop entertainment at this traditional Italian feast.